If you’re building your own solar power system, getting the best solar battery is a must. Solar batteries can be the best source of power storage and backup and can run everything in your house. With them, you maximize your ability to use the electricity generated by your solar panels on a day-to-day basis. During the times when you need more electricity than your solar panels are producing, you can use the solar energy you have stored. While there are many benefits from having a battery storage system to store the energy your solar panels produce, delving into the world of solar batteries can get confusing, particularly since they are expensive and are difficult to change after your solar storage system is built. Solar batteries come in many different types and sizes. Most people are familiar with the 12 volts battery system – this is simplest and most standard battery system that is used in vehicles, RVs, and boats, but in the world of solar energy it should be your choice only for a small simple battery system. By reading this guide you’ll understand why. What’s the best deep cycle battery for your RV? This guide will show you how to choose the best solar batteries for your home solar panels (small and off-grid system) and how to make the most of every amp-hour of them. You can also find out more about how to wire multiple solar batteries together in the system to make them more efficient. At the bottom of this guide are some tips that will help you charge your batteries faster and ensure maximum service life. This is a long guide, so if you don’t have time to read and learn, here are our picks of the best solar batteries on the market that you should buy. Solar batteries are simply deep cycle batteries that provide energy storage for solar, wind and other renewable energy systems. They are a key component in an off-grid solar energy system. In other words, solar batteries are the heart of a solar PV system. Even if you’re installing solar panels on the roof of your house or your RV that are already tied to the utility grid, you’ll still need solar batteries if you are trying to use power in the event of an outage. Without solar batteries, you can only use power at the time solar panels produce it. Solar batteries work by storing the DC energy being produced by your solar panels during the day and make it available when the sun isn’t shining. In most cases, you have to use a power inverter with your batteries to convert DC electricity into 120 volt or 230 volts AC for use in the home. Overcharging is the enemy of any deep cycle battery, your solar batteries also need a solar charge controller to manage the power from solar panels going into them. A solar charge controller ensures that the batteries are not overcharged during the day, and that the power doesn’t run backward to the solar panels overnight and drain the batteries. Which type of solar batteries is best? For many years, solar storage systems mainly relied on lead-acid batteries. They were individually designed and often involved significant installation time and cost. Solar batteries on offer today are packaged as large single or small modular units, can be flooded lead-acid, sealed lead-acid (AGM or Gel cell), lithium-ion or several other chemistries, can store much greater amounts of energy in a smaller volume. In most cases, lithium-ion batteries are the best option for a solar panel system, though this type of deep cycle batteries is still relatively expensive and can cost you a lot more than other types. Flooded lead-acid batteries are the cheapest option but they have a short cycle life (500 or less) and require a bit of maintenance. To choose the best solar battery type, it is important to understand the advantages and disadvantages of each type, its upfront cost and especially to make sense of what is covered under the warranty. Until recently the most common chemistry used for home solar batteries, especially in off-grid locations has been the flooded lead-acid battery, also known as “wet cells”. It is similar to multiple car batteries strung together to provide more capacity. Their main advantages are proven reliability, safety, and fairly low upfront cost. The main disadvantages are bulk and corrosion. They also require regular maintenance, need to be kept upright to prevent leakage and must be kept in a ventilated environment. For this reason, many homeowners are switching over AGM batteries in which you don’t have to care about the needed maintenance. Personally we think flooded lead-acid batteries are the best solar batteries for those who enjoy monitoring and maintaining their system, while AGM batteries are best for those who have an “out of sight, out of mind” attitude. The best flooded lead-acid batteries for home solar PV systems are Trojan’s deep-cycle lead-acid batteries. Trojan Battery Company is the world’s leading manufacturer of deep-cycle batteries and their deep-cycle flooded lead-acid batteries are one of the most widely used solar batteries for large off-grid solar PV systems. Absorbent Glass Mat (AGM) technology became popular in the early 1980s as a sealed lead acid battery for military aircraft, vehicles, and UPS to reduce weight and improve reliability. The AGM battery is a type of lead-acid battery in which the electrolyte is absorbed into a fiberglass mat. You will find that the plates in an AGM battery are flat like flooded lead-acid batteries, or they may be wound into a tight spiral (like Optima batteries). The internal resistance of AGM batteries is lower than flooded cells; they can handle higher temperatures and self-discharge more slowly than other types of batteries. In some respects, AGM batteries are similar to Gel batteries. AGM cells are leak-proof due to the captive electrolyte and do not need much ventilation under normal conditions. However, unlike gel batteries, AGM cells use the same charging voltage as flooded batteries and are more compatible with solar electricity systems. This means they can be used in combination with flooded cells, though this setup is not recommended as it may degrade battery life. Other advantages of AGM batteries are that they are non-hazardous, relatively lightweight, resistant to cold temperature, not inclined to heat up (low internal resistance) and able to hold a static charge for a long time. We also like the fact that AGM batteries have much higher life-cycle but only cost a bit more expensive than flooded lead-acid batteries. Overall, it seems AGM batteries are a perfect option for off-grid solar power systems. Our favorite AGM batteries for solar PV systems is the Vmaxtanks 12V 125Ah AGM Deep Cycle Battery. This is one of the best solar battery on the market. 8 of these batteries wire in 24 volts systems will give you a capacity of 500 amp-hours. Gel lead-acid batteries are specialized in deep-cycle applications. They use fumed silica as a thickening agent for the electrolyte, which makes the cells more sturdy. The viscous electrolyte prevents the cell from leaking when damaged. Gel batteries also ventless and discharge at a slightly higher rate than flooded cells. Gel batteries actually predated the AGM type but are losing market share to the AGM’s. This due to Gel batteries have a few serious downsides that make them a sub-par option in solar storage. First, they tend to have very narrow charging profiles and can be damaged easily by charging them inappropriately. The low charging voltage makes it very easy to accidentally overcharge the battery and destroy it. This is particularly true in solar electricity systems, where electricity production is variable. In addition, gel cells are more expensive than flooded cells and do not provide much better amp-hour capacity. However, like AGM batteries, gel batteries don’t need much maintenance and also resistant to vibration and shock. They are excellent for extreme conditions because they have higher boiling points. They also have a higher life-cycle than AGM batteries and flooded batteries. 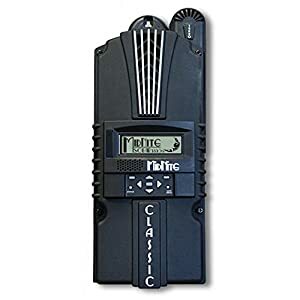 If Gel batteries are charged with a proper solar charge controller, such as Outback Flexmax 80 FM80 MPPT or Midnite Solar Classic 150 MPPT Charge Controller, you can expect it to provide a very good performance. 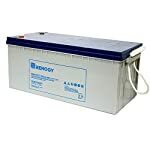 One of the best and least expensive Gel cells for solar PV systems is the Renogy Deep Cycle Pure Gel Battery 12V 200Ah. This solar battery is designed particularly for off-grid solar power systems. Wiring eight batteries in a 48-volt battery system will give you a capacity of 19.2 kWh (400Ah at 48V). Solar batteries for home solar panels are increasingly focused on lithium-based chemistry which have seen a steady decrease in cost in recent years. Lithium-ion batteries are also widely used in cordless power tools such as cordless impact wrenches, cordless air compressors and more. These batteries are small and light in comparison to their capacity. They can be efficiently charged and have relatively long lifespans. Not all lithium-ion batteries are the same. The best type of lithium-ion batteries for your solar panels is Lithium Iron Phosphate (LiFePO4). LiFePO4 batteries are totally SAFE, won’t burn or explode, stable and maintenance-free for 15 to 20 years. It offers good electrochemical performance with low resistance. This is made possible with nano-scale phosphate cathode material. The key benefits are high current rating and long cycle life, besides good thermal stability, enhanced safety and tolerance if abused. The biggest advantage of lithium-ion batteries is its extremely high life-cycle (3000-5000 cycles) and its high charge and discharge efficiencies which help harvest more energy from your solar panels. They also lose less capacity when idle, which is useful in solar installations where energy is only used occasionally. With these reasons, lithium-ion batteries are a good choice for any solar PV system, small or large, off-grid or grid-tied. The biggest disadvantage is its high price tag. A lithium-ion solar battery system can cost 4 times as much as a flooded solar battery system. 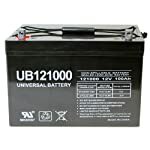 One of the best and least expensive lithium-ion batteries for solar PV system is the Battle Born Batteries 100-Ah LiFePO4 12 volt Deep Cycle Battery. This battery can be used in 12V, 24V, 36V or 48V systems. 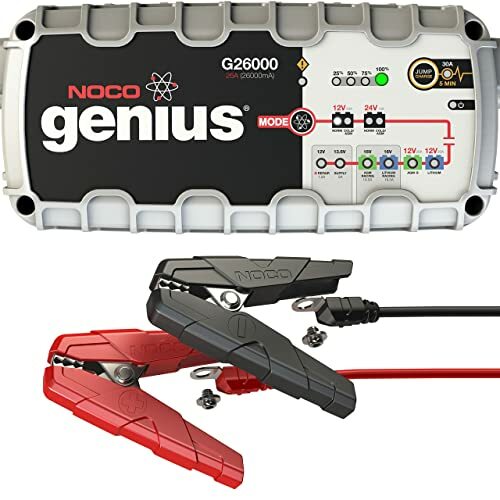 At only 29 lbs, it packs the power of a 140 lb lead acid battery and lasts 10 times longer. Flooded, AGM, Gel and Lithium-ion Batteries – Which is better? 12 Volts, 24 Volts, or 48 Volts? What’s the best voltage for your battery bank? Because battery voltage is difficult to change after your energy storage system is built, so that is the MUST-ASK questions before buying your solar batteries. 12 volts is simplest and most standard, used in cars, RVs, and boats. If you want a small simple power system, 12 volts will probably be easiest. Today, most solar storage systems are 24V or 48V since these systems have some technical advantages over the 12V system. Higher DC voltages means lower cost. Connecting fewer modules in series (a PV source circuit) means fewer conductors and connections, reduced voltage drop, fewer fuses or breakers, and fewer or smaller combiner boxes. Higher voltage also means lower current for the same amount of power, which allows using smaller-gauge wire that costs less. In addition, most customers seem to want more power over the years. A 12V DC system with a tiny 12V power inverter is difficult if not impossible to upgrade/upsize. So if you think you will have more than 500 watts of solar modules, consider 24 volts. If you plan on living off-the-grid completely, the 48-volt battery system is the best choice. Bear in mind that a good solar charge controller is relatively expensive, so consider using models that support 24V and 48V battery systems from the first, such as Midnite Solar Classic 150 MPPT Charge Controller – this charge controller supports up to 150V DC input. 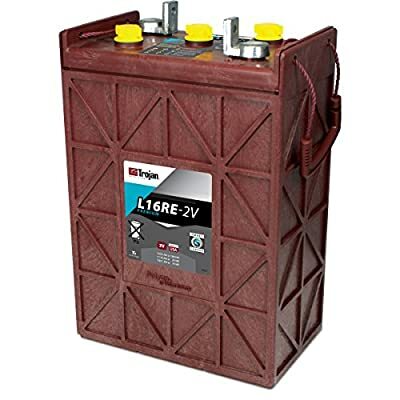 Often the 2V deep cycle batteries offer the largest amount of storage; however, you may need up to 24 of these huge deep cycle batteries, if your system is 48 volts. You can use a group of eight high-capacity 6V golf cart batteries then wire them in series to get a 48V solar battery system. If you’re building your off-grid solar power system, we highly recommend VMAXTANKS 12-Volt 125Ah AGM Deep Cycle Battery. This heavy-duty deep cycle AGM battery is one of the best solar batteries on the market. It’s also one of the most popular deep cycle batteries that are used in the solar power industry. 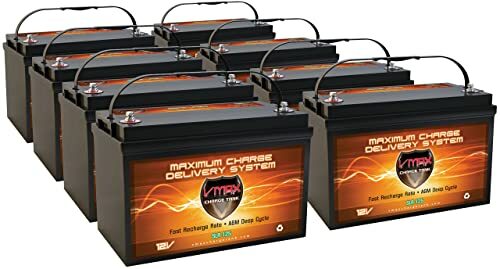 The VMAXTANKS 12-Volt 125Ah AGM is available on Amazon and is an excellent battery for the price. The amp ratings and performance match many of the super-premium brand batteries, but at half the price. These batteries are excellent for cold weather and you can feel confident knowing your solar batteries will always be charged, even when the temperature is below freezing. You can expect the battery to last about 8 to 10 years without any needed maintenance. When it comes to building a large home off-grid solar PV system with flooded batteries, the Trojan L16RE-2V Renewable Energy 2V Deep Cycle Batteries are some of the best solar batteries currently available. These batteries are the best choice for those who want to run large appliances, such as refrigerators or air conditioners, off battery power. Trojan batteries one of the best brands. These all pass rigorous quality tests, so you will never have a problem with your batteries. The terminals are free of corrosion and the reservoir is quite large, so the charge holds for years. They do require regular maintenance but this kind of task is very easy to do. Trojan’s batteries are designed to have a battery life of at least 10-years and comes with an 18-month warranty. This battery can operate in extreme condition such as high/low temperatures, remote locations and other challenging conditions. The L16RE is available in 2-volt and 6-volt sizes. This 2V version offers the largest amount of storage (1110Ah). If your system is 48V, you’ll need up to 24 of these 2-volt deep cycle batteries wiring in series. A group of 24 batteries means you’ll have a battery system with a capacity of 48V x 1110Ah = 53.2 kWh – this is a huge energy storage system. If you’re looking to purchase more than 4 of Trojan’s flooded batteries for your solar storage system, consider the Trojan T105-RE 6V 225Ah batteries. These are very good high-capacity flooded solar batteries for the price. If you buy a pack of these batteries on Amazon, you might have an excellent storage system at less than $1000. This is awesome for those on a budget but want to get reliable solar deep cycle batteries for their off-grid solar power system. With proper charging and watering, you could expect 8 years easily. This is essentially the Golf cart sized battery, but this is no golf cart battery it has been totally redesigned for renewable energy applications. It has a 5-year warranty. 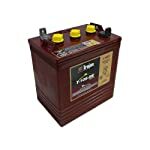 In a 48 Volt series connected string, these batteries provide an excellent power to any kind of household appliance. Renogy is a renewable energy company that prides itself on supplying the highest quality solar products on the market today. Renogy’s deep-cycle pure gel batteries are considered the best solar batteries on the market, specially designed for off-grid solar power systems. It’ll give you maximum storage for any solar setup and can deliver up to 1000 cycles at 50% DOD. This battery is a pure Gel battery. So it’s maintenance free battery thanks to the gel-like material inside the battery making it completely sealed. It’s equipped with PE compound separator construction, which ensures that gel electrolyte is distributed evenly throughout the inner battery and ensures the best evenness of all parts of the battery. Valve regulated sealed construction and triplex strengthened sealing on terminals and posts prevent electrolyte leakage, and guarantee the airtight and liquid state of batteries in normal operation and prevent external air from entering battery inner. Because of the use of lead-calcium grids alloy, Renogy batteries have low self-discharge and reliable performance. In-room temperature, self-discharge ratio per month of Renogy battery is about 3% of the battery capacity. However, these solar batteries are Gel batteries so they are typically expensive and are sensitive to overcharging. But if you install them in a system that has an MPPT charge controller everything would work fine. Universal Battery is a leader in competitively priced sealed absorbent glass mat (AGM) and gel technology. 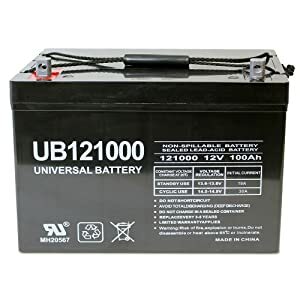 The Universal UB121000 12v 100AH is a decent battery. However, the short 12-month warranty leaves more to be desired, especially for the price. That being said, the battery can handle a wide range of temperatures, can be mounted in any position, requires no maintenance and may be transported by Air or Ground without any special handling regulations. LiFePO4 lithium-ion batteries are the safest, strongest and most reliable solar deep cycle batteries available. They outperform and outlast all other types of deep cycle batteries. 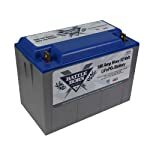 The Battle Born Batteries 100Ah LiFePO4 12-volt Deep Cycle Battery is 100% MADE IN THE USA and is one of the best solar batteries on the market. It weighs only 29lbs and is made from 100% safe, nontoxic materials. It’s designed to last 3000 cycles up to 100% depth of discharge, at which point the battery will still hold 75 to 80% of its energy capacity. This battery can handle extreme temperatures, have very long life spans and can be recharged very fast. Battle Born Batteries also offers an excellent warranty, so you can get a full replacement if the battery fails within the first three years. How to size your solar battery bank? How much energy will your appliance(s) use off the battery bank? The first piece of information that you need to know is how much energy (in kWh) you are consuming daily or weekly. The easiest way to know your energy consumption is to look at your monthly energy bill and estimate your daily consumption. You could also calculate your energy consumption by knowing which energy resources you use. For example, if a TV of 90 W would consume 90Wh in one hour. A refrigerator with 700W power necessity would consume 1400 Wh in two hours, and so on. The most accurate way of determining the energy consumption of your appliances is using the Kill-A-Watt meter. Lead acid batteries will give you around 50% of their rated power. Li-ion batteries will give you around 80 – 90% of their rated power. Choosing an efficient solar inverter is very important. Let’s say you have an 85% efficient inverter, and your AC consumption is 850 Wh. That means your solar batteries should be at least 1000 Wh in order to cover you’re your loses due to the inverter. The second part of sizing your solar batteries is the potential days of autonomy. This is the number of days where no power generation is possible due to clouds or rain, despite the fact that you continue to consume energy. On a normal day, you could count on 5 hours of sun, however, you’d have to consume energy for 24 hours. Two-days of autonomy means, your batteries would be large enough to supply continuous energy for full two days without charging. Three to five days of autonomy is accepted as normal battery sizing. One of the key components of a solar power system is the charge controller. A solar charge controller manages the power going into the battery bank from the solar array. It ensures that the deep cycle batteries are not overcharged during the day, and that the power doesn’t run backwards to the solar panels overnight and drain the batteries. A solar charge controller is available in two different technologies, PWM and MPPT. We generally recommend homeowners using MPPT charger controller, this type of solar charge controllers is more expensive than PWM, but it’s worth it to pay the extra money as an MPPT charge controller can boost system performance by up to 30%. An MPPT charge controller will adjust its input voltage to harvest the maximum power from the solar array and then transform this power to supply the varying voltage requirement, of the battery plus load. Thus, it essentially decouples the array and battery voltages so that there can be, for example, a 12-volt battery on one side of the MPPT charge controller and a large number of cells wired in series to produce 48 volts on the other. If one module in your 48V system produces 10 amps and two parallel strings of modules are used, your system will produce 20 amps at 48 volts. Certain factors such as light reflection or cloud effect at irregular intervals can increase current levels. This is quite common. Therefore we increase the charge controller amperage by a margin of 25% bringing our minimum controller amperage to 25. We migrate over to our catalog and we find a 30A charge controller, which is a very close match. What’s the best MPPT charge controller for my solar batteries? These are some of the best MPPT charge controllers for solar batteries that we recommend, but almost any modern controller will work fine. To get the most out of your solar batteries, it’s important to choose an efficient solar inverter. There are 2 types of inverters: pure sine wave and modified sine wave. Pure sine wave is always the most efficient inverter for any solar power system. It’s also needed if you’re going to run your laptop, smart TV, refrigerator off the solar battery bank. You should choose an inverter that can convert the DC voltage that matches the voltage of your battery bank. In the USA most residential and business use is 120V single phase. Homes will often use 240V split phase for larger loads such as a clothes dryer, well pump, and electric stove. So your inverter should also support both 120V and 240V output. Additionally, you must determine what your maximum wattage draw will be if all of your appliances that may be on at the same time, are on. If you have a 900W water pump, a 1000W refrigerator, and a 100W TV, you need to add the wattages together to get at least a 2000W inverter. 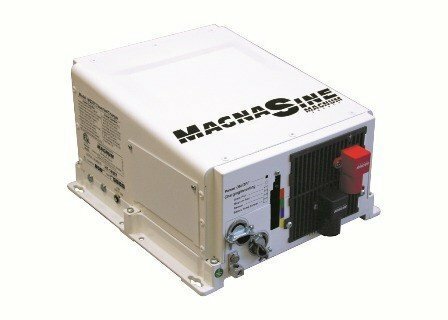 If your solar power system is an off-grid system, we highly recommend Magnum Energy’s American-made inverters. These are the best off-grid solar inverters available. If you’re on the budget, consider some cheaper pure sine wave inverters from AIMS Power, Go Power, Power Bright, or Renogy. These inverters are quite good for the price. Read more: how to choose the best charger for your deep cycle battery? There are going to be many times when the sun isn’t shining and your batteries are low. The only choice you might have is to charge your batteries using a portable generator. Most generators have a 12V DC output built into them, however, trying to charge a battery using this is almost a waste of time. The 12V DC output is usually limited to around 8 amps the voltage can fluctuate and is not suited to effectively charge batteries. The MOST EFFICIENT way to charge your solar batteries without solar panels is to connect a Smart Charger to the 120V/230V AC outlet of your generator. A smart charger uses 3 or more stages to charge the battery bank exactly the way it wants to be charged depending on its state. By upsizing the smart charger you can charge the battery at a much faster rate than the generator’s standard built-in unit. There are several ways to wire multiple solar batteries to achieve the correct battery voltage or capacity for a particular DC installation. Wiring multiple solar batteries together as one big bank, rather than having individual banks makes them more efficient and ensures maximum service life. Wiring batteries together in parallel has the effect of doubling capacity while keeping the voltage the same. For example: 4 of Vmaxtanks 12V 125Ah batteries wired in parallel will increase capacity to 125Ah x 4 = 500Ah but still only 12V. And the system capacity is 12V x 500Ah = 6 kWh. Wiring solar batteries together in series will increase the voltage while keeping the amp hour capacity the same. For example: if you have 12 of Trojan L16RE-2V 1110Ah batteries wired in series will give you 2V x 12 = 24V, but still only 1110Ah. And the system capacity is 24V x 1110Ah = 26.64 kWh. Most solar battery systems are a combination of series and parallel connections to archive both a higher system voltage and capacity. For example: You have eight of Trojan T105-RE 6V 225Ah batteries and you want to have a 24V solar storage system. Wiring them in series/parallel will give you 24V with 450Ah capacity.